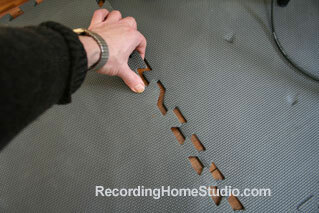 This is a method I use myself and it is a dirt cheap way of soundproofing for studio walls and floors at home. If you are, or plan on recording at home, you’ll be most likely setting up in a bedroom, a corner of the living room, or recording in the garage. That’s great for convenience and easy accessibility, but the square corners and hard walls and floor surfaces in our homes create the problem of sound ricocheting and bouncing all over the place and messing up our ability to accurately judge our recordings. Our goal is to dampen, absorb and randomize the shape and surroundings of the recording home studio environment. * I stumbled on the perfect acoustic material for soundproofing my home studio when I was in the hardware store. What I found is the foam tile-type exercise mats or sectional mechanic’s mats. These foam type mats fit together like a jig-saw puzzle enabling you to put them together in any shape or size needed. Simply drive very small brass nails through the mat (like those found in picture hanging kits) to attach them to the wall. 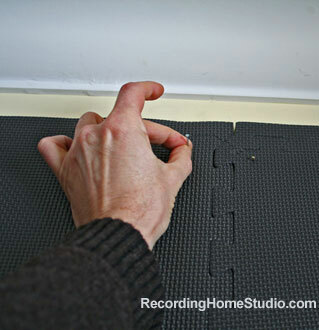 We want to be able to re-position the foam tiles as needed, so do not glue the foam mat tiles to the wall. Also, no one needs to mess up their walls. Multiple shapes and sizes of area rugs. Nowadays you can get inexpensive fake oriental area rugs or modern designer knock-offs that create a nice vibe and do the job of dampening and absorbing sound reflection off the floor. Foam exercise tiles as described above. You could potentially tile your whole home studio floor with these snap together foam tiles. Instead of getting these mats in the home gym section of your sports store, the identical product is available even cheaper in the tool section of the hardware store, but they market them as mechanics’ mats. Who else wants to make a wickedly effective vocal recording booth in seconds… AND costs almost nothing? Get on the advance list now by clicking “Contact Us” below. Just put “Your book” in the subject line and you can be among those who are first in line to get my book.